Now registered GavelSnipe members can quickly add auctions to GavelSnipe straight from Heritage Auctions, Movie Poster Exchange or eBay auction pages! and Links toolbar, view an auction and GavelSnipe-It! 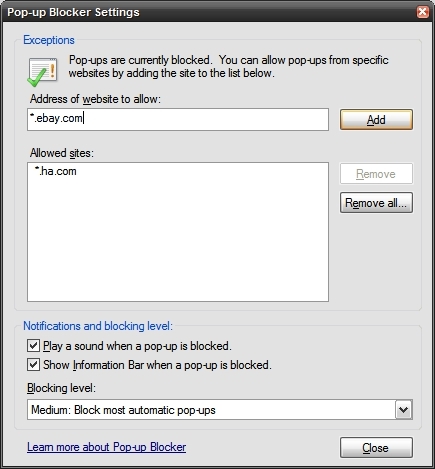 Disabling Pop-Up Blocker for GavelSnipe-It! GavelSnipe-It! works from a pop-up window and may be blocked by your browser security settings. Follow the instructions below to allow GavelSnipe-It! to pop-up in eBay, Movie Poster Exchange and Heritage Auctions. If Internet Explorer Pop-Up Blocker is enabled, GavelSnipe-It! must be added to the Pop-Up Blocker allowed sites list. Click the yellow warning bar under the toolbar for the Pop-Up Blocker settings menu. Add *.eBay.com, *.movieposterexchange.com and *.ha.com to the Allowed Sites list. You can now use GavelSnipe-It! with the sites you have added to the allowed site list. Right click this link, GavelSnipe-It!, and click "Add to Favorites.."
A dialog box will warn you that you are adding a Favorite that may be unsafe. Click "Yes" to continue. GavelSnipe-It! is safe to use, contains no spyware and will not harm your computer. Go to Heritage Auctions, Movie Poster Exchange or eBay and search for items you want. Open the page for the desired auction and click the GavelSnipe-It! bookmark from your favorites. The GavelSnipe-It! popup window will appear. Just enter your user name, password (if prompted) and maximum bid, then click "Submit". You're ready to snipe that auction with GavelSnipe. Click on the Links directory to select it and click "OK". GavelSnipe-It! will appear in the Links Toolbar. If your Links Toolbar is not displayed, right click on the Address Toolbar. Make sure that "Links" is checked and "Lock the Toolbars" is un-checked. You can now click and drag to widen the Links Toolbar or click and drag it to the toolbar position you prefer. You can then relock the toolbar by right clicking on the toolbar and rechecking "Lock the Toolbars". Go to Heritage Auctions, Movie Poster Exchange or eBay and search for items you want. Open the page for the desired auction and click the GavelSnipe-It! Link on the Links Toolbar. The GavelSnipe-It! popup window will appear. Just enter your user name, password (if prompted) and maximum bid, then click "Submit". 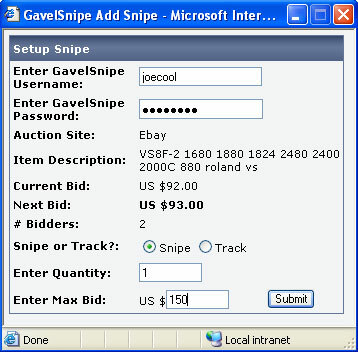 You're ready to snipe that auction with GavelSnipe. 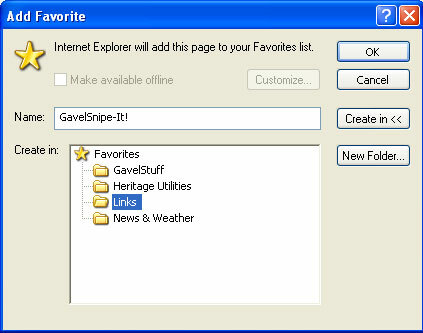 Drag the following link to your Bookmarks Toolbar: GavelSnipe-It!